You will need to go to a hospital if you are sick. Most clinics and hospitals are open during the daytime on weekdays only. They are closed on Saturday afternoon, Sunday, and public holidays. If you need to go to the hospital on weekends or public holidays, you need to find out which　hospitals are on duty that day. You can call the Sapporo city Call Center　(011-222-4894, 7 days a week, from 8 a.m. to 9 p.m.) for this information. Please call the hospital to check hours in advance. You may have to wait a long time if it is crowded. It will be helpful if you take notes on your symptoms, including when and how the symptoms started, whether you have a fever or diarrhea, what your appetite is like, and whether you have any allergies. (!) If the emergency occurs on a weekend or during a holiday, click here. ★Notes on symptoms and other information, such as when and how it started, if your child has a fever or diarrhea, what’s her/his appetite like, and if s/he has any allergies. 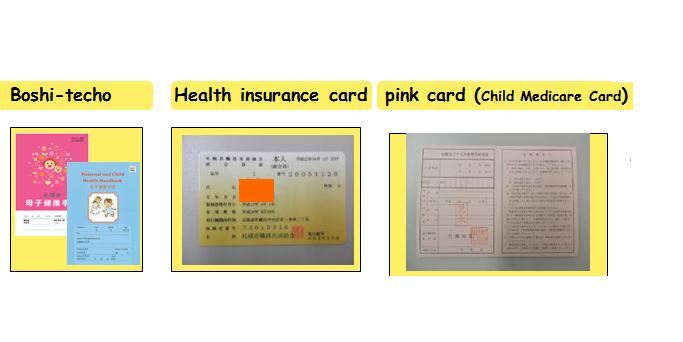 1.Show your health insurance card and the pink card (in some cases your boshi-techo too). Wait until you are called. 2.After seeing the doctor, pay at the cashier’s window and receive the prescription. 3.Bring the prescription to the pharmacy and get the medicine. *This card is called “Pink card”. *It expires each year at the end of July. Be sure to get your new pink card before it expires.